Smartphones « Global Market Insights, Inc. The rising occurrence of a host of advanced, complex cybersecurity threats has helped impel the global virtual private network (VPN) market, given that these threats stand to jeopardize the integrity, privacy and data of businesses. With globalization becoming widely commonplace, and businesses striving to expand their sphere of influence to operate on an international level, the need for organizations to connect their business units together has also risen in proportion. These factors, over the last decade, have made the internet the preferred platform for companies and individuals to conduct their business. However, the vulnerability characterizing the internet has rendered it extremely inadequate in terms of security, a flaw that cybercriminals typically exploit to commit frauds & thefts. In a manner of speaking, the VPN technology facilitates a cost-effective and safe solution to the issue of safeguarding company networks. The growing prominence of wireless devices across different organizations & businesses would thus drive the growth of VPN market as improving internet speeds coupled with falling prices are catapulting the rate of adoption of a plethora of wireless & mobile devices. Given that such devices are commonly used across organizations to access several applications present on private company networks from remote locations, the VPN technology has consolidated itself as an extremely crucial business component, thereby driving VPN market trends. The commercial sector is one of the most prominent application segments of the global VPN market. Comprising end-use domains such as the BFSI, healthcare, manufacturing, government and IT & telecommunication sectors, VPN market size from commercial applications is expected to grow at an impressive CAGR of about 15% over 2018-2024. This growth can be primarily attributed to the surging practice of digital recordkeeping and the adoption of cloud technology in these sectors that is completely changing the way customers access their information, rendering VPN technology as the backbone of these businesses. While, organizations in these domains usually utilize a VPN of their own, a majority of them opt for commercial VPN services provided by private companies. According to Surveillance Self-Defense, an independent non-profit organization, a commercial VPN is a privately offered service that provides organizations a secure channel to relay their data over the service provider’s own network. These services, if hosted in a foreign nation, while protecting users’ data from cyber threats, also protect the information from local governments and allow the information to bypass national censorships. Remote access connectivity has been touted to be one of the most deployed models in VPN market. The increasing need of organizations to find a secure as well as affordable way to relay secure company data from their private network to employees working at a remote offsite location is a primary factor driving the growth of the remote access-based VPN market. As opposed to site-to-site VPN, which allows a large-scale business to connect a cluster of its offices in several fixed geographical locations with each other, the ability of the remote access topology to connect individual hosts to their respective organization’s private networks makes it an ideal match for small & medium-sized enterprises (SMEs). Incidentally, the topology also allows employees from large organizations working through site-to-site VPN to connect to the company’s network remotely and be able to perform their work from a remote location over home networks or public Wi-Fi networks without worrying about the security of company data. 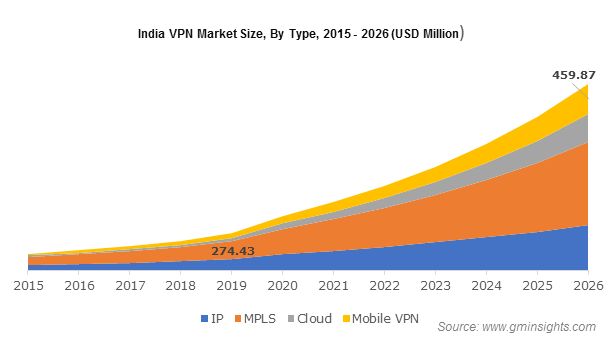 Aided by the convenience and reliability provided by this model, the remote access connectivity-based VPN market size is projected to register a CAGR of approximately 17% over 2018-2024. Attributed to the rising need for facilitating proper secured channels for the exchange of data over an increasingly connected world, the global virtual private network is expected to successfully thrive in the overall technology space in the forthcoming years. According to a report by Global Market Insights Inc., driven by the increasing rate of VPN adoption in myriad businesses, the overall virtual private network market valuation is anticipated to surpass $54 billion by 2024. This entry was posted in Sustainable & Smart Technologies and tagged BFSI, Cloud VPN, Commercial, Consumer, Extranet, Global Virtual Private Network Market, Government, Hardware, Healthcare, IP, IT, Laptops, Manufacturing, Mobile VPN, MPLS, Multiprotocol Label Switching, PCs, Remote Access, Service Providers, Services, Site-to-site, Smartphones, Software, Tablets, Virtual Private Network Market, VPN Market, VPN Market Analysis, VPN Market Leaders, VPN Market Report, VPN Market Share, VPN Market Size. The rapidly transforming interface technology and the on-going advancements in product design have been propelling multi-touch equipment market trends. The emergence of high-definition graphics along with the advent of new technologies such as IoT and artificial intelligence have also had a positive influence on the product development. The ease of application and design integrity of multi-touch devices has encouraged most of the end-users to adopt this next-generation transformation. Most of the consumer electronic product manufacturers, automakers, and several other industries have been inventing touch displays for real-life products. Depending upon the consumers’ approach toward the acceptance of such a computing interface, the players in the multi-touch equipment market have been unveiling a diverse portfolio of varied products. The growing availability of highly advanced touchscreen devices will thus have a considerable influence on industry growth over the years ahead. The launch of newly designed and multi-functional electronics equipment installed with touch systems will turn out to be rather beneficial for the contributors in the multi-touch equipment industry. A few days ago, Ideum launched a smart coffee table with integrated touch systems. In the Pico smart coffee table, it has installed an 8th generation graphics card and advanced touch technology that supports nearly 80 simultaneous touch points. This newly developed touch coffee table enables a user to automate the varieties of system tasks with the help of RFID software utilities. The surging requirement of such smart tables in schools, libraries, waiting rooms, corporate offices, and the retail sector is likely to propel the product demand on a large scale. In another instance, a leading OEM, Smartron has launched a next-generation multifunctional laptop with a multitouch feature in India. It is noteworthy to mention that India has been emerging as one of the largest markets for consumer electronics across the globe, and the launch of such advanced computing context devices will help consolidate its stance in the global industry. With the development of such multitouch supported devices, companies have been trying to modernize the functionality of electronic devices. The increasing demand for mobiles, smartphones, and numerous electronics gadgets with touch screens across India will also propel the multi-touch equipment market size. Consumers giving preference for the products integrated with such touch screen technologies has been encouraging designers to deploy touch displays into their products. Nowadays, in order to attract more consumers, most of the companies have been tapping the latest technology trends such as the Internet of Things and artificial intelligence. On these grounds, product manufacturers have been signing long-term agreements with technology companies. For instance, recently, Microsoft announced its plan to launch an IoT and Intelligent Edge solution for its device partners. The newly developed device integrated with multitouch collaboration tools can be incorporated in MS Office and other Microsoft team applications. The advanced version of products having IoT spatial intelligence capabilities will help end-users tap the environmental data and enhance the users’ experience. 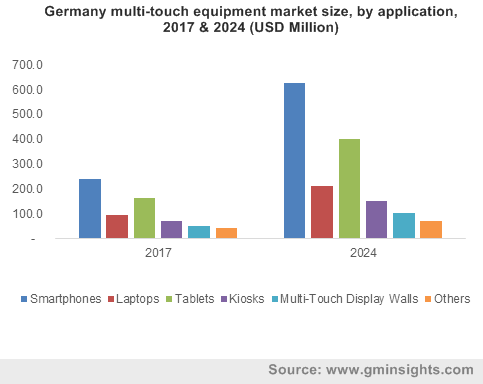 The increasing use of touch displays to boost the product performance and operational capability is thus likely to promote multi-touch equipment market share. Over the last few years, in order to resolve the design related problems of product development engineers, several companies have been continuously involved in the development of touch encoders. Recently, Grayhill, Inc., introduced a touch encoder development kit for the engineers who are looking forward to replacing traditional user input devices with multi-touch gestures. The development of the touch encoder kit has apparently helped software engineers configure the device very easily. The increasing availability of advanced design and customer friendly electronic devices will thereby have a considerable impact on the growth of multi-touch equipment industry outlook. 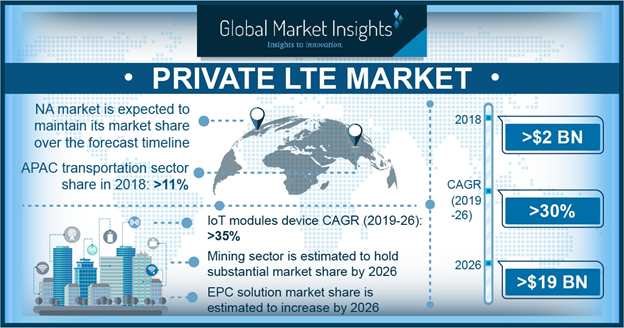 The escalating use of infotainment systems in the vehicles along with the surging deployment of multi-touch equipment in TVs, smartphones, laptops, and tablets are the most pivotal driving forces influencing the commercialization landscape of multi-touch equipment market. Heavy investments in R&D activities to modernize the existing product ranges also will push the industry trends ahead. For the record, multi-touch equipment market size is slated to be pegged at an appreciable USD 20 billion by the end of 2024. This entry was posted in Sustainable & Smart Technologies and tagged Kiosks, Laptops, Multi-Touch Display Walls, Multi-Touch Equipment Market, Multi-Touch Equipment Market Growth, Multi-Touch Equipment Market Research, Multi-Touch Equipment Market Trends, Screens, Smartphones, Tablets, Touchpad, Trackpad. The consumer electronics sector is soaring with the growing popularity of UHD TVs. The UHD/4K panel market has already generated a heavy momentum in this space with the development of next generation TVs. Ultra HDTV has gradually emerged from a techie’s dream to consumer reality in the recent past. This UHD technology is unlocking transformative, awe-inspiring, and enhanced viewing experience with a minimum resolution of 3840 x 2160 pixels. 4K resolution provides around 8 million pixels and is called so as a result of the images being about 4,000 pixels wide. The increasing number of platforms offering higher resolution of HD content will further expand UHD panel industry growth. Moreover, government initiatives to minimize custom duties particularly in India and China and the dropping prices of 4K panels will stimulate UHD market over the coming years. UHD/4K Panel Industry is estimated to grow at a rate of 11% over the period of 2016-2024. In 2015, the television application accounted for over 55% of revenue share and is set to register a CAGR of 11% over the period of 2016-2024. Demand for better customer viewing due to improved picture quality will propel 4k panel industry growth. Retail is another booming sector which has been penetrated by the UHD technology. This is undoubtedly helping retailers to display their products with minute details and supreme clarity. A memorable shopping experience with UHD displays owing to its superior quality is attracting larger consumer base, thus driving ultra-high definition panel market. Digital display screens market worth USD 4 billion in 2015 is set to witness a significant growth curve, owing to rising demand from the advertising and publishing sectors. The growth of digital signage market due to rising commercial application in advertising is also worth noticing. Devices equipped with UHD panel are highly energy efficient and durable. LG, Toshiba, Sony Electronics, Panasonic, Philips, Sharp, BOE Technology Group, Hisense Group, and Samsung Electronics are the major players accumulating maximum share of ultra-high definition panel industry. These players are highly emphasizing on product development and customer service to keep up with growing competition for providing better image quality. 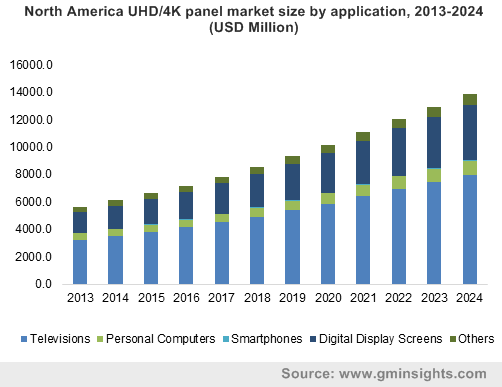 The demand for 60-inch and above screen size is projected to record a substantial growth in UHD/4k panel market. For achieving better displays of mobile and tablet screens, LED technology is used which accounted for more than 45% in 2015 and is estimated to grow at an annual rate of 8.8% over the period of 2016-2024. LCD segment is another booming technology, projected to record USD 18 billion by 2024, owing to its lower power consumption feature. LCD uses the light modulating properties of liquid crystals which is gaining high preference in global UHD panel industry. In terms of regional split, Asia Pacific ultra-high definition panel market share catered for over 20% of the overall industry in 2015 and is set to hit a CAGR of 11.6% over 2016-2024. North America 4K panel market, led by the U.S., is estimated to generate a revenue share of over USD 19 billion by 2024. The regional growth is subject to huge tech-savvy consumer base and intensive adoption of HD technologies. Early deployment of this technology is likely to show tremendous growth prospects for future trends in 4K panel industry. Heavy investments in research and development will send strong undercurrents for the future of consumer electronics. Developments in this area are really going to be interesting to watch over, in the next couple of years. This entry was posted in Electronics and Media and tagged 4K Display Market, 4K Panel Market, 4K Panel Market Size, 4K TV, Digital Display Screens, LCD, LED, OLED, Personal Computers, Smartphones, Televisions, UHD 4K Panel Market, UHD Panel Market, UHD TV, Ultra High Definition Panel Market.